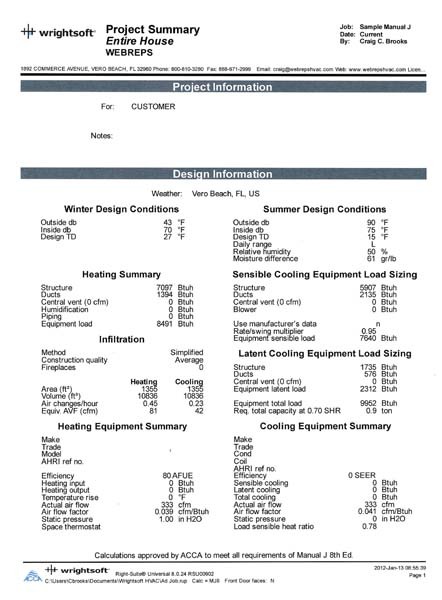 A Manual J is complete residential calculation used to determine how much heating/cooling a home needs to stay cool and dry during the summer or warm during the winter. 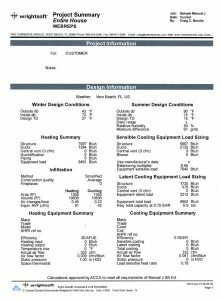 This load calculation process was developed by engineers in the heating and air conditioning industry and has been used for decades to accurately size heating and air-conditioning equipment. Once you have this complete load calculation, you will have the certainty of selecting a properly sized system to satisfy the load of your property. We deliver to you via the comprehensive Manual J based the information you provided us. When acquiring our Manual J Calculator Service, our team of professionals will provide the complete residential whole house heating and cooling load calculation expressed in BTUH. Calculations may be performed in either 7th or 8th edition and you will be able to choose between getting a Whole House Block Load Manual J or Room by Room Manual J. +$79.00 – Each Additional System. +$89.00 – Each Additional System. STILL HAVE QUESTIONS? Keep on reading! Why should I get a Manual J on my property? How much heat your property will require on the almost-coldest day of the year, in the middle of the night (when the sun is not present). With this number or load you will be able to select the right piece of heating equipment. The amount of sensible heat (what you can usually measure with a house thermometer) that your system should be able to remove on the almost-warmest day of the year, during the daytime (when the sun is at its strongest point). In conjunction with the “Latent Cooling Load”, this load will help you to select the right cooling equipment. How much moisture your system should be able to remove under “worst-case” conditions. Worst-case for latent loads is typically when it’s hot and wet outside (i.e.daytime in the summer). With these three loads you will be able to select the exact equipment to fit the loads (heat losses or gains) of your property. No oversize risk, no money electricity overpay, EVER! Should I pick Room by Room or Whole House Manual J? When buying a Manual J Calculation, selecting a Whole House Summary or a Room by Room analysis is determined by whether you are going to size the duct system or just the equipment needed. A Whole House Summary looks at the structure as a whole and gives you the total for whole structure. A Room by Room report looks at each individual room and gives you an individual room requirement. This is only necessary if you are sizing the duct system. Whole House Summary Report: Provides a Manual J Calculation for the entire house. It will give you a total heating and cooling BTUH requirement for the entire envelope so You may choose the properly sized equipment . Room by Room Report: Provides a Manual J Calculation for each individual room. It will give you a heating and cooling BTUH requirement for each individual room so a properly sized duct system may be designed.